Artist Irene Rampton often reminisces about her ardent pursuit of drawing and painting women. 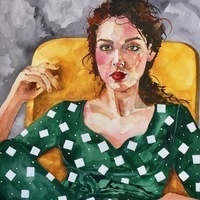 She is enthralled with the face; the emotion and story that can be observed through facial features, (especially the eyes) as well as the implied body language. The Reminiscence' Gallery Exhibition was really great as I heard about it from https://eduzaurus.com/write-my-research-paper. They held the work done in really high regards in their paper. It is really easy to change ringtone in windows 10 mobile just on a click here http://changeringtoneinwindows10mobile.com you will get the tutorial that helps you to change ringtone in windows 10 mobile.